The Act on the Prevention, etc. of Child Abuse (Act No. 82 of 2000) provides for the prevention and detection of child abuse and measures to be taken after any child abuse has been detected. Table 5-1-6-2 shows the number of cleared cases and persons cleared for the acts of child abuse stipulated in the said act (refers to abusive acts on children younger than 18 by their guardians) as penal code offenses, etc., by type of offense over the last 10 years. The number of cases/persons cleared for homicide, injury, assault, and forcible indecency significantly increased in 2008 when compared with 1999. 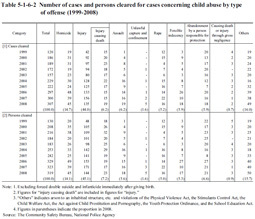 Table 5-1-6-3 shows the relationship between the victim and the perpetrator (the perpetrator's position) in cases concerning child abuse by type of offense in 2008. The number of fathers, etc. was the largest with 221 persons (69.3%) for all offenses, while mothers, etc. were large in number for homicide and abandonment by a person responsible for protection with 35 (77.8%) and 17 (81.0%), respectively.